SMR’s selflessness ensured that a bad day for me didn’t become an even worse day for my family. His wife and three girls get to enjoy many more years with their father thanks to you. Never underestimate the value of what you do. Seattle Mountain Rescue pulled me up the mountain and lowered me over a steep section on the other side. All while I was strapped in a sled. In a storm. And in the dark. I wouldn’t be here today if it was not for the selflessness of your members. I can't thank you and everyone else enough. We are all very fortunate to have people that are willing to donate their time and talent to others. You brought my son back to me. And for that I will be forever grateful. Incorporated in 1948, Seattle Mountain Rescue is a volunteer organization of seasoned alpinists dedicated to saving lives through search, rescue, and mountain safety education. It specializes in mountainous terrain searches and high angle rescues, primarily in King County, Washington. It is a fully-accredited member of the Mountain Rescue Association and the King County Search and Rescue Association. Whether it’s checking to make sure you have your 10 Essentials for a short day hike or creating an itinerary with an emergency contingency plan for a multi-day overnight camping trip, ensure you take the proper precautions before heading out. Far too many of our rescues could have been avoided. 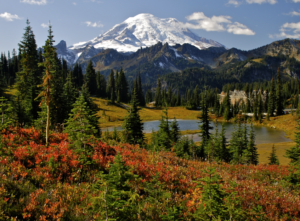 Fall Hiking Season is upon us and @Seattle Mountain Rescue has been working with local nonprofits in our outdoor community to help get out the word on safe hiking. Over the next several weeks you will see safety tips and article shared by our friends at @Washington Trail Association @Mountaintosound greenway @seattlemountaineers @ESAR @IssaquahAlps trail Club.